T12 Fluorescent Lamps - Traditional fluorescent lighting technology, improved. Federal energy legislation mandates the phase out of many of the older T12 linear fluorescent lamp types. Advances in newer, more energy efficient fluorescent systems like T8 and T5, and CFL, give end users every opportunity to replace outdated T12 systems and lower their electric bills. For those maintaining existing T12 systems, SYLVANIA offers a full range of wattages, lengths, shapes and styles. There are improved, higher performance ,long life options as well. 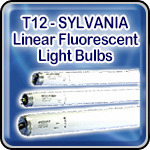 The SYLVANIA DESIGNERï¿½ SUPERSAVERï¿½ ECOLOGICï¿½ family of EPACT compliant T12 fluorescents operate on the same ballasts as full wattage lamps and offer many of the benefits of our T8 products. SUPERSAVER T12 lamps provide energy savings of up to 20% over full wattage lamps. Just change the lamps to start reducing your energy costs.